Eating disorder diagnoses are characterised by a pattern of disordered eating behaviour alongside symptoms such as body dissatisfaction and preoccupation with food, weight or shape (APA in Diagnostic and statistical manual of mental disorders, DSM-5, APA, Washington, DC, 2013). Incidence rates for eating disorders have increased during the last 50 years. However, epidemiological studies have suggested that such trends may not be a true representation of the occurrence of these illnesses in the general population, with figures underestimated due to reduced help seeking and poor access to care, particularly amongst ethnic minorities. This case study explores the experiences of a young British Indian woman with bulimia nervosa. Arising from an in-depth semi-structured interview, analysed with interpretative phenomenological analysis, her narrative offers a critical lens onto how diverse fragments of cultural practices and meanings come together to produce the clinical category of ‘bulimia.’ It thereby offers an alternative portrait of relationships between eating disorders and ‘culture,’ one that goes beyond a framing of these illnesses as culture inscribed on the body. 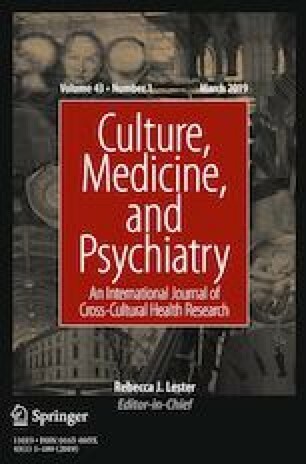 Interrogating relationships between culture and the development, expression and maintenance of bulimia is suggested to be key to forging culturally-sensitive understandings of this illness; this paper begins to provide the evidence base for the design and development of appropriate support services, thereby aiming to contribute to a reduction in health inequalities and barriers to treatment. Incidence rates for eating disorders such as anorexia nervosa and bulimia nervosa have increased in the UK and internationally during the last 50 years and continue to rise, in part due to greater public health awareness leading to earlier recognition and detection, and wider availability of treatment services (van Son et al. 2006; Hoek and van Hoeken 2003; Pawluck and Gorey 1998; Wakeling 1996). Nevertheless, epidemiological studies show that eating disorder trends over time may not necessarily give a true picture of the occurrence in the general population and that figures may be underestimated, possibly due to poor help-seeking behaviour, or the failure of General Practitioners to detect or refer individuals to specialist services (van Son et al. 2006; Hoek and van Hoeken 2003). Eating disorder aetiology is known to be multifactorial (Klein and Walsh 2003). Research suggests that socio-cultural contexts, family circumstances, negative affect, low self-esteem and body dissatisfaction are some of the factors that may play a role in their development (Polivy and Herman 2002). Socio-cultural factors, in particular, are argued to be influential in both the development and maintenance of eating disorders (Gordon et al. 2002). Eating disorders have long been regarded as ‘culture bound syndromes’ (Prince 1985) that are particularly seen within Western industrialised societies (Keel and Klump 2003) amongst white affluent women who strive towards thin body ideals (Solmi et al. 2014; Soh et al. 2006; Keel and Klump 2003; Miller and Pumareiga 2001). This interpretation dominated early social analyses of anorexia in particular, tending to regard that as the extreme on a ‘continuum that begins with normal dieting’ (Garrett 1998:23; see also Bordo 2003; Malson 1997). Such accounts thereby priviledged a linear model of the relationship between culture and eating disorders, seeing these illnesses as culture writ on the body (see Bray 1996). This not only denied a sense of agency to individuals’ experiences of eating disorders; it also risked propounding a one-dimensional notion of what culture is and how it acts. In contrast, recent anthropological analyses have explored relationships between culture and eating disorders in ways that go beyond a focus on the body. These have highlighted the meanings of embodied practices across various empirical and geographical contexts (Lavis 2015, 2018; Warin 2010; Gooldin 2008). Whilst recognising psychiatric categories as themselves cultural, like earlier studies of culture and eating disorders (Grange et al. 1997; Ratan et al. 1998; Anderson and Hay 1985) these anthropological discussions have explored similarities and divergences in the clinical characteristics, as well as day-to-day practices, of eating disorders across populations. In so doing, they have highlighted how cultural meanings and values play a role in the origination, embodied expression and maintenance of eating disorders (e.g. Lester 2007; Eli 2014; Pike and Borovoy 2004). Yet, although recent scholarly discussions have thereby moved beyond an earlier conceptualisation of eating disorders as distinct to Western upper class young women, there remain significant knowledge gaps regarding the complex interrelationships among these illnesses and culture. The prevalence of eating disorders in non-Western populations was first explored in the late 1970s (Soh et al. 2006; Makino et al. 2004; Chisuwa and O’Dea 2010; Soh and Walter 2013). These discussions gave rise to debates regarding causality, and drew on concepts of ‘Westernization,’ ‘modernization’ and ‘acculturation’ to ‘Western values’ (see Gunewardene et al. 2001; Littlewood 1995; Nasser et al. 2001; Yoshimura 1995). Whilst undoubtably valuable in recognising the circulation of cultural imaginings and their impact, it has also been argued that this focus on acculturation comprises significant issues. In particular, Rebecca Lester has critiqued ‘the way culture is talked about’ (2004:607) in such discussions, arguing that a causal emphasis on acculturation leaves an idea of culture as bounded and tethered to place on the one hand (the ‘other’s’ culture) and yet transportable on the other (Western culture) (ibid. 608) in a way that is ‘both overly simplistic and empirically incorrect’ (ibid. 608). It risks seeing culture as within an ‘other,’ which echoes Arthur Kleinman’s (1997) critique of the Diagnostic and Statistical Manual. Acknowledging the tensions over what we mean when we talk about ‘culture’ in anthropology (Clifford and Marcus 1986; Agar 2006), this paper rejects earlier notions of culture as bounded or singular and acknowledges that ‘it is precisely these sorts of understandings that are mobilized in the current scholarly literature on the cultural features of psychic distress, and eating disorders in particular’ (Lester 2004:609). Instead, we recognise culture as ‘contested, temporal and emergent’ (Clifford 1988:19). Thus, seeking to go beyond a discussion of acculturation, we nevertheless take culture seriously; we draw attention to the ways in which culturally-specific meanings are invoked and employed by our participant herself to frame the overlapping spheres of social practices through which her bulimia is developed, shaped and articulated. As such we interrogate how culture is ‘a resource put to work’ (ibid. 25), in how she articulates her illness as well as something that shapes experiences and help-seeking. Both reduced help-seeking and poor access to care have been highlighted as particular issues for ethnic minority populations in the UK, as well as in Australia and the US in relation to eating disorders (Tareen et al. 2005; Waller et al. 2009; Mond et al. 2007; Cachelin et al. 2000, 2006). This suggests that community epidemiological studies may not show a true representation of the occurrence of eating disordered practices in a diverse and multi-cultural society (Smink et al. 2012) such as Britain. Cultural barriers to help-seeking have been suggested to impact on the care of ethnic minority groups. These include stigma, shame and guilt (Schmidt et al. 1997; Becker et al. 2010). However, personal barriers, such as denial, motivation and lack of awareness of the eating disorder have also been suggested to have an impact (Mond et al. 2007; Vitousek et al. 1991; Geller et al. 2004; Schmidt and Treasure 2006; Vandereycken and Humeeck 2008). A qualitative study in the UK revealed South Asian culture to play a significant role in the maintenance of eating disorders. Although the findings suggested that South Asians have similar risk factors for the onset of an eating disorder to the wider British population, there were substantial differences in accessing support from family members and healthcare services. Key barriers were silence, fear of stigma and ostracization, and lack of knowledge (Dave 2008). However, in terms of intersections between cultural background and healthcare participation, there are also wider structural contexts to be acknowledged. A UK comparative study of referrals to an eating disorders service in Leicestershire between 1991 and 2005 of South Asian and Non South Asian individuals showed that the proportion of referrals for female South Asian individuals was much lower than expected when compared to the population of the city (Abbas et al. 2010). Other studies have shown that ethnic minorities are less likely to be referred for the treatment of eating disorders in comparison to Caucasians in the UK (Waller et al. 2009; Becker et al. 2003). Likewise, Table 1 shows the total number of referrals of Asian individuals to an eating disorder service between 2013 and 2015 in the West Midlands was 6%, which is also much lower than the Asian population in the region in the most recent Census in 2011, which was 26.62%. Against this background, this case study explores a British Indian young woman’s (Reeya) lived experiences of developing bulimia nervosa and her journey into a specialist eating disorder service in the UK.1 It examines the cultural and psychosocial factors that influenced the development of her eating disorder and how she sought informal and professional help. The case study treads between ‘critical cultural analysis and descriptive consistency’ (Lester 2004:611), to recognise psychiatric categories themselves as cultural whilst also utilising the diagnostic paradigm of bulimia as ‘a common set of understandings’ (ibid. 611) against which to explore cultural specificities. In so doing, it addresses existing knowledge gaps by disentangling how culture ‘comes to matter’ (Kierans et al. 2016:26) in Reeya’s lived experiences of bulimia. We suggest that interrogating how culture influences the development, expression and maintenance of eating disorders is key to forging contextually sensitive understandings and providing the evidence base to design appropriate support services, thereby reducing health inequalities and barriers to treatment. This cultural case study derives from qualitative research exploring risk factors for the development of eating disorders (2013–2015). 45 participants were recruited, 15 of whom were family members/friends, whose narratives do not feature in this paper. The 30 service user participants were being treated for an eating disorder through English National Health Service eating disorders outpatient, day-patient and inpatient services and all were within five years of being diagnosed with an eating disorder. When do you feel that your eating disorder began? When you look back now at the time that you began to binge or restrict, what do you remember about that? Looking back now, what do you think caused you to alter your eating practices? How did you come to get the help of a doctor? The topic guide was used flexibly to allow the interviewer to follow unforeseen discursive themes that emerged and participants were invited to talk about any other aspects of experience they felt were important to highlight to the researcher. In line with the epistemological framework of the study, this aimed to maintain an openness to participants’ concerns throughout data collection. Interviews engendered a reflexive process of co-examination between participant and researcher of the meanings that individuals attributed to their eating disorder experiences, as well as the relationships between these and wider cultural and social processes and healthcare structures. Sampling was designed to offer maximum demographic variation (e.g. gender; age; ethnicity) as well as phenomenal variation (e.g. diagnosis) (Sandelowski 1995). That the majority of participants are white British reflects the make up of the treatment population, although not the ethnically diverse region in which the hospital is based (see above). The participant for this case study was purposively selected to explore the pathway through bulimia nervosa from the perspective of a female British Indian (participant highlighted in bold—Table 2). All participants were recruited through their treating eating disorder service and were approached by a member of the study team in the waiting areas of clinical spaces. All participants in the study were given an information sheet prior to interview, which explained the aims of the study and what their participation would involve. At that point they also had the opportunity to ask any questions. If the participant was happy to take part, the researcher arranged the interview at a time and place convenient for the participant. Written consent was obtained before beginning the interview and reconfirmed verbally afterwards. Each interview lasted approximately an hour at the direction of participants. The interviews and recruitment were done by one of four researchers (Lavis, Channa, Palmer, Connor), with the same researcher carrying out both stages for each individual participant. The interview was audio recorded and professionally transcribed verbatim. Recordings and transcriptions were anonymised to protect each participant’s identity and stored on secure drives at the University of Birmingham. Reeya is a pseudonym. The research was reviewed and approved by the NHS Research ethics committee (rec number: 13/WM/0389) and also by the University of Birmingham (ethics number: ERN_13_0628). The study has been funded by the National Institute for Health Research as part of the Collaboration for Leadership in Applied Health Research and Care West Midlands (CLAHRC WM). All the transcripts were analysed using thematic analysis. The interview that is the focus of this paper was then re-analysed using interpretative phenomenological analysis (IPA). IPA was employed as it is an appropriate method for use with a single case study due to its encouragement of small, purposively-selected and carefully situated samples (Smith et al. 2013). The transcript was independently read and re-read to get familiar and close to the participant’s account by Channa and Lavis (Channa having also conducted the interview, and Lavis having also designed and led the overall study). This identified preliminary themes by mapping the interrelationships, connections and patterns across the exploratory notes (Smith et al. 2013). The emergent themes were then discussed by Lavis and Channa and these were grouped together as clusters under ‘super-ordinate’ themes. A final stage of analysis probed the relationship between this transcript and the themes across the data set as a whole to ‘test out’ the cultural specificities of Reeya’s narrative. This ensured that the analysis went beyond a simple description of content to engage with the relationships between themes across the data set, as well as with wider cultural and social processes and structures. This paper was then drafted by Channa and Lavis jointly. IPA allows examination of interactions among events, objects and people, building on the fundamental principles of phenomenology, hermeneutics and idiography (Smith et al. 2013). In this paper it offers a way to engage with Reeya’s own explanatory frameworks and meaning making, exploring how she makes sense of the major life events of developing bulimia and entering treatment (see Conrad 1987; Smith et al. 2013). Avoiding assumptions that ‘British,’ ‘South Asian’ or ‘Indian’ are culturally homogenous, this analytic method has allowed us to interrogate the ways in which Reeya herself invoked cultural specificities to frame and interpret particular aspects of her experiences and practices; it has payed attention to her meaning making in relation to the complex and overlapping ‘webs of significance’ (Geertz 1973:5) in which her experiences are embedded. Reeya is a young South Asian Indian young woman in her early 20s, born in Britain. She was diagnosed with bulimia nervosa in her late teens and later came into contact with an urban Eating Disorder service in the Midlands as an outpatient. Reeya’s mother passed away when she was a toddler. Thereafter she moved in with her grandparents. Her father remarried a short time later and she moved back in with her father and step-mother. She did not get along with her step-mother. She described her relationship with her parents (father and step-mother) as “hostile,” and recounted pervasive family pressure in terms of high expectations around education, marriage and career. Reeya attended an all-girls grammar school and described it as being quite competitive. She could not recall having had any difficulties with body image or eating prior to the age of 16. When she was in year 12, she recalled feeling quite large and began to weigh herself. At that time, Reeya and her friend began a Weightwatchers diet plan to lose weight for a big ball at the school. Reeya went from being 55 kg to 47 kg and felt a sense of happiness, pride and achievement, even though her BMI measured slightly underweight. Reeya went to university at 18 and described her living circumstances there as stressful and lonely. She pursued a course that was dominated by young women and she did not get along with her flatmates. She recounted her first year as being the hardest year of her life. Reeya discussed feeling quite self-conscious about her appearance when she started University. She described developing an increasing pre-occupation with weight, concerns over body image, daily intake restriction and then overeating/binges in the evenings. Reeya sought help through her supportive boyfriend who accompanied her to the GP as a first point of access. The GP felt that Reeya’s eating patterns would not classify clinically as bingeing. However, since the GP recognised that she had very low self-esteem and was unhappy with the way she looked, Reeya was referred to the student counselling services. A few weeks later, she was referred to see a psychiatrist and was diagnosed with bulimia nervosa with restricting tendencies. Three superordinate themes arose from the data: food and body image, which highlighted the overlaps and disjunctures between Reeya’s eating practices and her body image concerns; familial and social relationships, which showed how cultural meanings of mental health were played out in family and social relationships; and silence and stigma, which demonstrated how wider cultural discourses had negatively impacted Reeya’s feelings about her diagnosis, and her help-seeking. All three themes thread through the following discussion of results, which has been arranged into two sections to reflect the distinct temporality of Reeya’s own narrating of her experience. The first section, Into Bulimia: Cultural Entanglements, Eating and the Gaze of Others explores the factors that Reeya described as contributing to the development of her bulimia. The second section, Through Bulimia: Silence, Stigma and Help-seeking, discusses the factors that Reeya described as contributing to the entrenchment and maintenance of her bulimia. Help-seeking will be further reflected on in the discussion section. …when I’m on Facebook and things like that, and I see people, pictures of people, I always feel like I analyse how they look. I know that’s really judgmental and things like that. And, I mean, I would never be rude about it, but, if anything, I compare myself to them, and I think, ‘Well, they’re a lot skinnier than me.’ Or, ‘Look at the size of their thighs. If I stand next to them in a picture, I would look really fat. …university, you really want to get along with people. And I guess at school you notice, like, similar - not similar looking people, do you know what I mean? - like, similar interests and things like that get along. And I knew that I wasn’t gonna be massive into loads of nights out and stuff like that, and I thought I might be, sort of, judged based on my appearance, because no one - like at school, like, you’ve known people for years and years, and you go through, like, growing up with them, so it doesn’t matter, really, what you look like, if you get along with them. Whereas here I was, like, ‘I’m gonna make a first impression, and I don’t want people to judge me based on my appearance.’ If they don’t think I look, you know, particularly skinny or tall or, like, you know, if I’m not, like, a pretty girl, they might not choose to talk to me in the first place, you know. I feel like women have to be quite self-conscious, erm, in my culture anyway, because – well, talking about, you know, needing to be attractive enough to be married off to a man, and all this stuff. And, erm, as well, like, some of the clothes and stuff you wear, like, especially in the Indian culture, if you’re wearing a sari, you’ve got quite a short blouse……and if you can see your belly bulging out. I know my step mum’s commented on, like, other people being, like, ‘Oh, can you see her belly, like, bulging out? and stuff. ‘You don’t want that,’ kind of, thing. She [grandmother] was always saying, like, ‘You can’t have a tire round your belly’. …I feel really big compared to all these girls in my course. And I’ve always – I think because of my parents always comparing me to other people, when it comes, like, to academically and always saying, like, to my sister, ‘Oh, you’re a lot bigger,’ comparing to my sister and, er, like, academically and physically - So I found myself comparing myself a lot to other girls in my course. This elucidates how Reeya’s focus on appearance has a more complex aetiology than might have been assumed from her discussions of school and university alone. Her own narrative positioning of a desire for thinness in what she described as “traditional” South Asian culture recontextualises her bulimia. Here, thus, thinness emerges less as a teleological ideal and more in terms of the constraining gaze of others on a body culturally gendered in particular ways. I went to an all-girls grammar school, so it was extremely competitive, in terms of your grades and things, and, like, I was literally trying so hard to keep up with all of these people. And then I knew that, even at the end of the day, like, when I did get a relatively, like, okay grade……it would never be high enough…, for, like, the school, high enough for my parents. So I never had any sense of, like……proudness of my achievements, and I never felt like I was doing enough. Whilst echoing previous studies that have shown that cultural differences influence eating attitudes in South Asian girls (Furnham and Patel 1994), and that greater levels of perceived parental control is a significant risk factor (McCourt and Waller 1995), Reeya’s subjectivity of “not doing enough” takes on a further layer of significance in relation to her eating practices. Although Reeya described dieting to lose weight, she also recounted how food had offered her a way of dealing with the exhaustion of a demanding course at university and her loneliness. She used certain foods as “comfort” as they enabled her to feel in control of situations that were causing her distress. I, sort of, sat in my room by myself and used food, I guess, as a comfort. And there was no one stopping me from eating it, and no one holding me accountable for what I was eating, and making sure I had, sort of, my three meals a day… So I just ate whatever I can get my hands on. Like, I don’t – I want to try and disassociate good food and bad food. But I feel that’s still too strong, to go on something like Weight Watchers, because I think I would only let myself eat good foods, and not let myself have, you know, they have, like, weekly treat points, or something, where you can give yourself a treat in the week. But I don’t think I – I don’t know if I would let myself, and then, you know, towards the end of the week, use them all at once, and that’s, you know, would count as a binge, and me feeling sick again. As well as echoing wider categorisations of food into healthy and unhealthy, such as in Weightwatchers as she suggests, Reeya’s ‘good’ and ‘bad’ foods echo eating disorder nosology. Yet, whilst she recognised that the tension of food as simultaneously good and bad is central to bulimia, Reeya also rooted this fraught in-betweenness in her South Asian upbringing. As such, her food practices come to be located in the same explanatory framework as her body image concerns but, importantly, these are dislocated from one another. Well the first few years of my life I grew up with my grandparents, and, and they were always very big on sweet treats…stuff like biscuits and cakes, and Indian sweets and all this stuff. So when my grandparents picked us up from school [...] erm, they would bring us like a box of sweets and things, that we could snack on the way home. …when my dad remarried and we moved back into a house with him and my step mum, erm, she was, like, a lot more restrictive about what we were allowed to eat. I didn’t always get along with my step mum, or, like, it was a new way of life for me, because of the way she disciplined us and everything was very different, I think I, I had made an association with sweet foods and, sort of, going behind my stem mum’s back and her not knowing about it, and it being, like, a nice thing. Erm, and that would go on, that went on for quite a while. This section has shown that Reeya’s body image concerns and food practices come together to produce the clinical category of ‘bulimia.’ However, they do so in unexpected ways; her body image concerns at university layer over an existing sense of being judged on her weight that is rooted in culturally-specific framings of the value of women. Likewise, her categorisations of food into good and bad elucidate a potent sense of moving towards and yet away from her childhood; holding on to the meanings of sweetness rooted in her early experiences mingles with a rejection of the distress that pervaded these. As such, both her body image concerns and bingeing are seen to be related by Reeya to wider cultural tropes and expectations but, importantly, not always to one another. Instead, we see how culture is layered in Reeya’s account as fragments of meaning and practice with diverging roots come together. The place of social, and familial relationships in this layering, which Reeya’s discussions of food have introduced, will be further explored in the next section, which engages with the various factors identified by Reeya as reinforcing or maintaining her bulimia. When you’re that tired you just want chocolate and food and stuff like that, and it ended up being a comfort, because I was by myself. I didn’t feel like I had, you know, particularly good friends. People on my course didn’t really socialise with each other, because we saw each other all day, and we didn’t want to go home and, like, speak to each other again [..] it was really hard, the first year, especially. I think that was probably the hardest year of, like, my life. So they [housemates] would go in, they would go out several nights a week, and get extremely drunk and come back and disturb me, like. Because I had to be up at six or whatever, to be into the hospital, but they, you know, had the whole day off. So they would come back at three and make a lot of noise, and it ended up being quite tense because of that. And, erm, I, I wasn’t gonna do that, and that was, like, the only way for me to get along with them was to be able to do that with them, and that’s what they, like, deemed as having a good time together. And I wasn’t really into all of that anyway, so I felt we didn’t really have much in common….Erm, and it made it difficult, because if you don’t know someone very well that you’re living with. …Erm, like, most people’s parents, when they drop them off to university, they’re like, ‘Oh, we’ll take you out in the car and see what it’s like around here. Take you to the shops. We’ll do a shop together.’ With my parents, they literally dropped me off, helped me bring my stuff upstairs, and just left…But it’s a kind of thing where I don’t always feel welcome when I go home either. And I don’t have that kind of relationship with them where if something’s going, like that is going wrong, I can’t pick up the phone and say…‘They’re giving me a really hard time. I don’t know what to do’. Reeya recounted how her parents expected her to deal with difficult situations alone, and she felt that there was a lack of understanding and empathy towards struggles that arose in relation to her housemates or course. These dual strands of isolation were described as influencing her binge eating behaviours. I don’t have that support from them, because I don’t feel comfortable talking to them about it. And it’s the kind of thing I feel like I would be ridiculed for, like, ‘Oh, no. You just need to learn how to eat healthy and not gain weight,’ and stuff like that. Overall thus, a prominent disconnect in her interpersonal relationships emerges from Reeya’s narrative, as well as a silence surrounding her eating disorder and its affective impact on her. This left her feeling unsupported as well as reinforcing the dual desires of her bulimia: to seek comfort in food and to try to become thinner. … I don’t know, maybe if I was in a different family I could talk about it. […] But, er, sometimes it makes – obviously, I haven’t told them about it – but it makes me feel, like, er, if I was in a different family, would my attitude to eating be different? Would my attitude to this whole illness - because it took me so long to accept that I did have a problem with food. I didn’t really have anyone to talk to, other than my boyfriend….Yeah. My boyfriend’s [family member] had anorexia, and her family, erm, are the most supportive people I could ever imagine. By emphasising her boyfriend’s cultural background as different from her own, Reeya situated the families’ diverging attitudes to her emotional distress and bulimia in contrasting cultural frameworks. When they [older family members] discuss other people in, sort of, a gossipy manner it’s, like, sometimes it’s just shocking, because obviously, I’m a different generation, and I’ve grown up here, so I know a lot about, like, you know, you learn about it in school. I did psychology. You learn about it. And they just won’t accept it. They will just – they will just pretend like it’s, it’s something to do with the person and, like, they’re making a big deal out of it. Like, there’s no such thing as, you know, mental health issues and, you know, don’t want to bother taking the medication because don’t think it’s gonna help. They’ll just pray to someone and hope something happens. Like, it doesn’t – it’s not about that, like, it’s a real issue. …with my sister, I can’t be honest about how I feel, because it’s seen to be, sort of, weak and, like, ‘Why can’t you just deal with it?’ And, like, I remember telling my sister about this whole eating disorder thing, and she was just, like, ‘Oh, don’t be stupid, like, just learn how to eat healthy and everything else will be fine. And it’s the kind of thing I feel like I would be ridiculed for, like, ‘Oh, no. You just need to learn how to eat healthy and not gain weight,’ and stuff like that.…They don’t understand the, sort of, mental aspect of it. I was, I was eating all this food, but sometimes – it sounds silly – but sometimes I felt like I was, like, a bit of a, a zombie almost. Just eating all this food, not being very self-conscious about what I was doing, but then, sort of, snapping out of it and thinking, like, looking at all these wrappers and thinking, ‘Oh, my God. I’ve eaten all of that.’ […] So I did a bit more research on, like, the NHS website and stuff like that, and, initially, I didn’t think anything of it. And I was, like, ‘Well, I mean, I know I’m fine, like, I don’t, I, I don’t have that much of a problem. It’s okay.’ Erm, and then I remember, a couple of days later, I decided to look into it again, and I was, sort of, reading more people’s stories about it, and the kind of things that they were experiencing. Because of the whole stigmatism (sic), I didn’t want to believe it [diagnosis]. I didn’t want to think, ‘You’re bulimic.’ And, I remember years and years and years ago, thinking, ‘I can’t stop myself eating all this chocolate.’ And not, not that I can’t, but, like, I, I would go to my grandmother’s. I’d be, like, ‘Oh, wouldn’t it be nice to not want to eat all this stuff and to be able to stop yourself and to…?’ Like, when people initially talk to you about stuff like eating disorders and people that are anorexic, I’m, like, ‘How can people be like that? because, like, I could never, I could never be anorexic.’ And if anything I, like – this sounds bad – but I almost wish I was, like, had that mentality, that I would be able to not eat this kind of stuff, and I would be able to stop myself from eating this kind of stuff. Erm, a, a bit, I think. It makes it – like I said earlier, like, it makes everything a lot more real Erm, and it makes, it makes you, kind of, think about it as a, […] I do have an illness, and I do have a problem, and I do need to get help for it. Erm, but at the same time it, like, it makes you think, ‘I’ve got a problem. Why have I got a problem? […] So I, kind of, veer between the two. Like, it’s a good thing, and it’s also a bit of a bad thing, because you feel like you’ve got a label now and you can’t really get rid of it. I don’t want to take medication, because I don’t want to have this, you know, ‘You have a mental illness.’ Like, even though I know it’s a stigma thing, I still don’t want it to be true, to some extent I don’t want to have to take medication for something, because then it makes it really real. My step mum had, erm, er, was diagnosed with, sort of, depression and, like, potentially, sort of, bipolar tendencies, and she just refused to take medication because there’s such a stigma with mental illness. Although the stigma arising from mental health diagnoses and treatments is not unique to South Asian cultures, these quotations show that Reeya’s struggle to conceptualise her distress as bulimia is patterned by culturally specific attitudes to mental health. This suggests that ‘silence and stigma’ may play an important part in causing delays in help-seeking. This case study has interpretatively explored Reeya’s journey to and through bulimia nervosa. It has sought to trace the various ways her Indian cultural heritage may have been a factor in the development and experience of her bulimia, as well as in her help-seeking. It is clear that Reeya presented with, and recognised herself to have, eating traits that are core to the diagnostic category of bulimia nervosa (APA 2013). For instance, she was pre-occupied with weight, concerns over body image, daily intake restriction, overeating/binges, classifying good and bad foods, setting herself high expectations, perfectionist traits and negative sense of self. This is in line with previous studies that suggest no difference between minority ethnic and Caucasian participants’ eating disorder psychopathology (Mitchell and Mazzeo 2004; Le Grange et al. 1997, 1998). Yet, what Reeya’s narrative does show is that we cannot assume that we know either the meaning or aetiology of an individual’s disordered eating practices from the fact that they may appear to present with core diagnostic tropes. Exposure to and adoption of Western values concerning attractiveness and thinness have been suggested to be primary risk factors for the development of eating disorders (Sussman and Truong 2011; Raberg et al. 2010; Mumford et al. 1991, 1992). Other influences have been suggested to include images presented by Western media that may overemphasize a preference for thinness which, in turn, may lead to a rise in body dissatisfaction and disordered eating (Becker 2004). This was evident in Reeya’s narrative whereby she felt “really fat” and regularly compared herself to other people on social networking sites. A recent systematic review on literature around acculturation and eating disorders found that both greater and lesser acculturation have been identified as risk factors for the development of eating disorders (Doris et al. 2015). Socio-cultural ideals are argued to be internalized by individuals and dissatisfaction with appearance is understood to be related to the degree to which individuals perceive themselves as not meeting those ideals (Thompson et al. 1999). There are resonances in Reeya’s account of pervasive Western constructs of ideal appearance; she perceived an ideal sense of beauty to be ‘thin’ and was constantly comparing herself to others, particularly at university. As such, Reeya’s narrative would, on the surface at least, seem to support literature that has expounded the association between exposure to the Western ideal of thinness and eating disorder development (e.g. Becker et al. 2002; Cachelin et al. 2000; Rodgers et al. 2015). However, this needs to be seen in the context of an existing internalisation of a woman’s value as resting on gendered cultural parametres of marriagability, which sees appearance as a commodity value in a very specific way. Reeya’s step-mother and grandmother would often make comments around weight and body image. There was an expectation of women to not have a ‘bulging belly’ or be ‘so large as no-one would marry you’. This demonstrates how Reeya’s interactions with her family environment influenced her perception of an ideal embodied self. It is important to understand how family communicates cultural messages about thinness and body shape which in turn may influence the development of eating disorders. As a mediator of culture, family has a formidable impact on identity, contributing to the development of the self and the formation of self-image (Walsh 1993). Additionally, inter-cultural and intra-familial conflict have also been argued to be a cause of eating disorders (Bryant-Waugh and Lask 1991). In Reeya’s case, she described a hostile relationship with her parents that continued while at University. There, she longed for an understanding and supportive relationship with her parents to help her deal with her emotional distress. The peer pressures and lack of social involvement at University, alongside the familial conflict, not only embedded her disordered eating patterns but also made her feel isolated which further intensified the development of her eating disorder. Previous research has shown that increased social isolation can further escalate an eating disorder (Trepal et al. 2012). Reeya’s disordered eating behaviour led her to respond by pulling away, distancing herself in order to achieve a sense of control. However, it is imperative to highlight that fraught family dynamics are not unique to Reeya’s South Asian family. Moreover, research suggests that familial variables do not act as independent risk factors to eating disorders but instead interact with other possible risk factors such as peer relationships and media that socio-culturally define body ideals. Whilst Reeya discursively framed her idealisation of thinness as impacted by acculturation to Western norms, she also identified it as rooted in her experiences of South Asian cultural norms. Echoing Lester’s discussions (2004), Reeya’s narrative thereby problematizes any neat causality attributed to acculturation, instead showing entanglements; her eating practices and body image concerns are each made up of a multiplicity of cultural meanings that together assemble the clinical category of bulimia. As such, her narrative supports the claim that future studies need to take into account the complexities of, or disjunctures in, acculturation to better understand eating disorders across cultural groups (Lowry et al. 2000). Moreover, it has been stated that conflicts and uncertainties towards identity, self-image and emotional responses are commonly present long before symptoms of disordered eating become evident (Buhl 2002). Reeya’s narrative suggests that cultural conflicts or overlaps may need to be reflected on in this light as her struggles to step across culturally-derived explanatory frameworks can be seen as a factor in the development and maintenance of her bulimia. However, it is perhaps by turning away from an analytic focus on appearance to one on food practices, as recent anthropological analyses of anorexia have done (Lavis 2013, 2015), that the complex layering of culture in Reeya’s account of bulimia becomes most apparent. We have seen that both her food practices and her body image concerns are multiple in aetiology, with their causes and meanings attributed to different cultural roots at different times across her interview. What is important though, is that food and body concerns are also dislocated from one another. Both eating and thinness are imbued with multiple meanings by Reeya, but not necessarily in ways that link them to one another, which has also previously been argued in relation to embodied practices in anorexia (see Lavis 2013). We therefore cannot assume a linear relationship between them, with Reeya’s eating practices and difficulties neatly aimed at or caused by her body image concerns. Instead, Reeya’s account problematizes an analytic focus on appearance as core to her eating practices. Rather, in line with recent literature that has explored binge eating as meaningful (Eli, 2015) and as a response to distress (Alpers and Tuschen-Caffier 2001), Reeya frames her food practices are mediators of her everyday life as she moves through and navigates cultural and interpersonal difficulties. Her narrative thereby supports Anna Lavis’s recent call (Lavis 2018) to reposition attention away from eating disorders themselves to engage with the distress and traumatic life events that may underlie these illnesses, and to recognise the complex meanings that food practices may come to have against this background. Reeya’s relationship with food is complex and layered; it is influenced by her childhood experiences whilst growing up with her step-mother when she began to use sweets as comfort, as well as related to times when her grandparents gave her sweets as snacks on the way home from school. Due to her difficult relationship with her step-mother, and the latter’s distressing disciplinary tactics, Reeya associates sweet foods with the creation of a moment apart during her childhood. Then, they offered a space away from her step-mother, which Reeya called a ‘new way of life’ that had given her moments of pleasure and comfort. This sense of using sweet foods to self-care and step outside one’s difficulties is reminiscent of Zivkovic et al.’s (2015) discussion of ‘sweetening’—the consumption of sugary foods as a means of coping through structural and individual hardship. These early relationships with, particularly sweet, food were then re-performed by Reeya at university, as the overlapping of familial expectations, cultural family norms and peer pressures resulted in a need to gain control by using food as a comfort from stressful thoughts and situations. As such, it becomes evident how, for Reeya, ‘experiences of binge eating constitute a metaphoric, embodied expression and negotiation of existential states’ (Eli 2015:367). From Reeya’s account also emerges cultural specificities to the discursive framing of these experiences of disordered eating and mental health more widely. This is particularly clear in relation to stigma and the ways in which this played an important part in both the development and articulation of her bulimia. Silence and stigma were seen to thread through her interview and play out in different ways through her life, at home and university. Reeya illustrated the difficulties in speaking openly with her family about her emotional distress and the lack of social peer relationships whilst at University. She struggled with the silence that met her attempts to express herself and articulate her eating disorder distress, which resulted in feelings of isolation and loneliness. These isolating spaces created a ‘lonely sense of self’ enabling Reeya’s bulimic practices to become more entrenched. It has previously been shown that isolation and difficulties in dealing with emotional distress can play a role in the perpetuation of bulimia nervosa (Esplen et al. 2000). Moreover, noticeably, mental health was a taboo subject within Reeya’s family and that had an impact on Reeya’s help-seeking trajectory. Research has suggested that one of the key issues about eating disorders within the South Asian community is that such issues are not widely talked about and mental illness is often hidden away (Lai and Surood 2008). Regardless of Reeya’s step-mother having been diagnosed with a mental health condition (depression), there was still a reluctance to accept the existence of any mental health difficulties in the family. For this reason, Reeya also found it difficult to reveal her disordered eating behaviours to her family, instead confiding only in her boyfriend. As such, her words echo recent work that has argued that shame, anxiety and stigma in South Asian communities can lead to delays in help-seeking for eating disorders and further isolate the individual (Mustafa et al. 2016). Although existing literature highlights that eating disorder behaviours are often hidden (Trepal et al. 2012), it has also been suggested that South Asian women may face further isolation when eating disorders are revealed due to cultural shame, anxiety and stigma. A recent systematic review showed that some of the most prominent barriers to help-seeking for eating disorders were stigma, shame, denial of and failure to perceive the severity of the illness, negative attitudes towards help-seeking, lack of encouragement from others to seek help and lack of knowledge about resources (Ali et al. 2017). In conclusion, although studies exploring eating disorders in ethnic minority populations have increased over the past few years (Soh and Walter 2013) there still remains a dearth of prevalence data from large population-based and epidemiological studies within these groups (Pike et al. 2013). Whilst eating disorders are no longer viewed as solely the domain of white Western upper class young women, there are clearly significant gaps in the literature. Further resarch into the experiences of eating disorders among non-Western and non-White populations, in both the global north and south, is needed to better understand how cultural factors may influence the development of eating disorders and help reduce health inequalities related to ethnicity. There is a need for culturally targeted prevention and early intervention programmes for eating disorders that focus on reducing stigma and shame, and increasing knowledge around help-seeking pathways, whilst also recognisng the complex, and often fragmented roles that culture may play in eating disorders. In the case material presented throughout this study, all names and identifying information has been altered to protect the anonymity of the individual. The research was funded by the NIHR Collaborations for Leadership in Applied Health Research and Care West Midlands + initiative (CLAHRC WM). The views expressed are those of the author(s) and not necessarily those of the NHS, the NIHR or the Department of Health and Social Care. All procedures performed in studies involving human participants were in accordance with the 1964 Helsinki declaration and its later amendments. The research was reviewed and approved through the NHS research ethics process (Rec Number: 13/WM/0389).